Besides Make up - I have a few other passions. If you haven't noticed from my blog - I tend to write about things that I enjoy - hair, fashion, decor, beauty and the list goes on. I always enjoy reading inspiration posts from other bloggers, it's intersting to learn what they are inspired by - so I thought I would share mine. 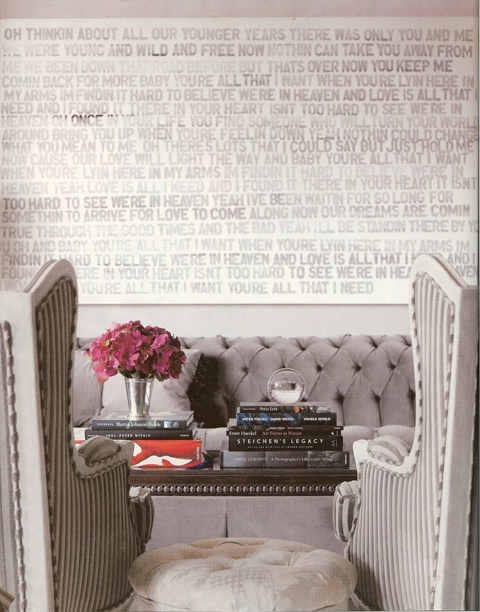 I saw this NY apartment in In Style's home magazine a few months ago and I fell in love. It belongs to the wonderful Molly Simms (who I happen to love). I think text is amazing on walls. like this desk paired with the dress stand. This room is simply beautiful. but she has the perfect lighting - especially that chandelier. Her bedroom is the most peaceful room in the house. Her apartment was designed by Kishani Perera a lead designer from Fuse ID. Ohh thanks for posting this- what a great inspiration...she has good style all around! LOVE love LOVE her apartment. I saw somewhere else where they showed the before and after and it's just amazing. From completely white and blah to magnificant! And I love Molly Sims!